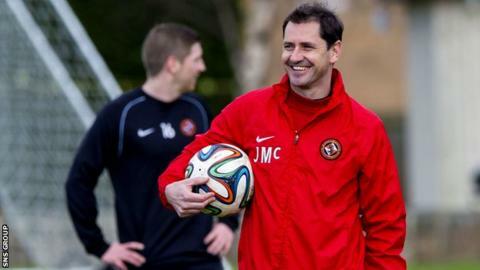 Manager Jackie McNamara is confident Dundee United can reach the Scottish Cup final as long as they equal Rangers's endeavour on Saturday. "Rangers have a slight advantage with it being their home stadium but Ibrox is a great place to go and play," McNamara told BBC Scotland. "You can talk about our pace and movement but we have to match Rangers physically to have the ball. "When we get flowing I think we can cause anyone problems." United failed in attempt to have the venue changed last month, with the Scottish FA sticking with the choice they made for both semi-finals in October. And the Tayside team will be backed by 11,000 fans in Glasgow as they bid to overcome the League One champions. Rangers are reeling from last Sunday's Ramsdens Cup final defeat by Raith Rovers, while United were beaten 2-0 at home by Celtic on Saturday. "There's a lot been said in the media trying to stir things up on the back of Rangers' result," said McNamara, who suffered a 4-3 extra-time defeat to former club Celtic at this stage of the tournament last season. "A lot of them have turned on [manager] Ally [McCoist] and the team and that might galvanise them. "And if you look at some of our players' comments, when you see what they've said the headlines are totally different - 'we'll turn up, we'll win' kind of thing. "But nothing changes for us. We'll go about it the same way. It's important we play our usual game. "Rangers have only lost two games all season - in cup competitions and in extra time. They have Premiership players. They've taken our club captain from last season [Jon Daly] and Nicky Law from Motherwell and then there are guys like Lee Wallace and Ian Black. "I don't read into what people are saying about their squad. I've been on one side of the Old Firm and one loss is a crisis and the manager gets it in the back." Full-back Mark Wilson has won the Scottish Cup twice with Celtic and would love to make it a hat-trick with United, where he started his career. "In terms of the season, this is our biggest game and it will be the same for Rangers," the 29-year-old told BBC Scotland. "It should be a fantastic spectacle and hopefully we can win and have a day to look forward to in May. "Some of our younger players played against Celtic at Hampden last season, so they have experience of the occasion and the atmosphere. "We have pace all over the side and great enthusiasm, a real will to win - the boys are desperate to go one better than last year and reach the final." Midfield enforcer Paul Paton is enjoying a great debut season at Tannadice and his partnership with John Rankin was described as "massive" by McNamara. But the 26-year-old was playing down his own role, preferring to praise his more attack-minded team-mates. "We know it will be a hard game," he said. "We'll go there confident but we'll give them the respect they deserve. "Rangers have got a big budget and good players. We are hoping the football will flow. We've got players who like to get the ball down and play. "We've got seven or eight players that can fill our front four positions and any one of them can do a job - they have done all season. "The Scottish Cup win in 2010 was marvellous for the club - that's why I came here in the summer. I had a couple of options but I thought this was my best chance for occasions like this."